Habitat: Desert, Upland. 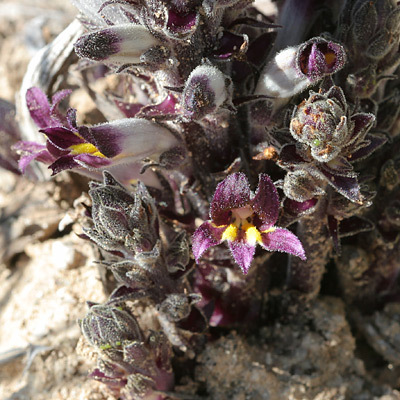 This plant grows in sandy soil near other plants that it can parasitize. 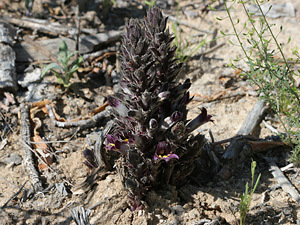 Description: The dark purple, cone-like, glandular-hairy inflorescences arise from pale, underground stems and often form large clumps. The individual flowers are 1/2 inch (1.3 cm) long, tubular, and bilateral with 3 lower lobes and 2 recurved upper lobes. These plants lack chlorophyll and are root parasites of nearby shrubs, usually those in the Aster Family (Asteraceae).